Narbert The Narwhal is probably best known for his gnarly antics on a surfboard. But did you know that when he's not hanging fin, he's an active member of his Arctic community? His awesome laid-back demeanor makes him the perfect go-to guy, er... whale. And sometimes, he even has to play peacemaker amongst his frosty friends. Our story brings us to one such occasion when tempers around the neighborhood are producing quite a few cold shoulders lately. That is, until one day, when a mother lynx cries out for help when her kitten is lost. Narbert rallies the neighbors, calling upon them to set aside their petty differences and silly arguments. All eyes, ears, and noses are needed if they are to find (wait for it... ): The Missing Lynx! (You may groan now.) Happily, their search proves fruitful and mother and kitten are soon reunited. Not only has Narbert convinced everyone to work together as a team, he helps them remember what's important – compassion, understanding, patience, and most of all, kindness. Lessons abound! This delightful K-4 musical is approximately 20 minutes long and includes five songs as well as a lighthearted script with short, easy-to-learn lines for your students. And though the setting is wintry, the time of year doesn't necessarily have to be. After all, the Arctic is cold and snowy year round. 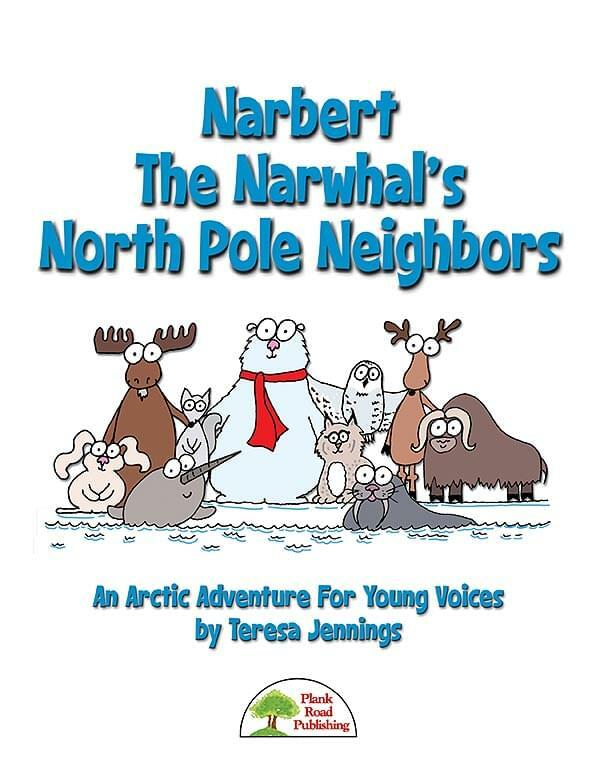 Fun costuming options include Narbert the Narwhal, as well as various Arctic animals, such as polar bears, snowy owls, moose, walruses, and more. The reference to the North Pole in the title also allows you the flexibility to turn this into more of a Christmas or holiday musical if you wish. This is easily done by adding characters and/or setting elements, such as Santa's workshop or more reindeer, elves, and so on. Both Print and Downloadable. Download is 77MB.